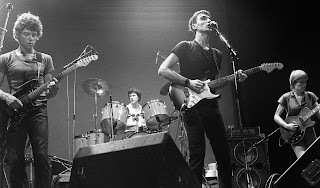 BrettBob's Back Porch: "Uh Oh Love Comes to Town"
"Uh Oh Love Comes to Town"
The first Talking Heads album I picked up was Stop Making Sense, an album I bought blindly knowing nothing about, other than I wanted some Talking Heads in my rotation. Often times record companies will fool a buyer by designing a live album to appear as a "Greatest Hits" album, disappointing the customer expecting to hear familiar radio hits. That wasn't the case with me and Stop Making Sense. As an Allman Brothers fan, I was into live music, and the Talking Heads were an excellent, energetic live band. Also, Stop Making Sense isn't your typical live album. It's one of the greatest concert films ever put together, artfully designed for stage by David Byrne, and expertly filmed by Jonathan Demme, who understood that the spectacle on stage was the attraction, not the LA crowd. Once I owned the film on disc, I watched it constantly (as my roommates will attest to). But there was still a lot of Talking Heads to explore. I picked up a bunch of their studio albums, including their first one, 77, which hits the ground running with the catchy and upbeat, "Uh Oh Love Comes to Town". As one of my favorite bands, I'm surprised it took me this long to cover a Talking Heads song. But I go in and out of love with them, listening to them in heavy doses and just as quickly turning them off for months. But not all music I enjoy listening to is music I can perform. David Byrne has a specific style and delivery that is difficult to adapt - his unique voice isn't always pitch perfect, but it's always honest and vulnerable. It's a similar issue I had when I covered a Lou Reed song. I tried to forget Byrne's delivery and sing it as if I'd never heard it before, which doesn't mean it's good, but it's less worse. I decided to adapt the steel drum to dobro and add a little mandolin to give the song the same fun, light step that attracted me to the original.